The City of Joy is well-known for its music, cinema, and delicious food, especially the mouth-watering sweets. In fact, it’s rather hard not to run into a sweet shop in almost every corner of the city, including the narrowest of the lanes. And, it’s equally hard to find a Bengali who is not in love with their ‘mishti’. Kolkatans are incredibly proud of the sweets of Bengal and their unique appeal. And for a good reason too — Bengali sweets have wooed Indians and foreigners alike. Sweets are also an important part of the culture and tradition of the city. Be it during the festivals or weddings or just greeting guests, Bengali sweets are always the stars of the show. Moreover, sweets have time and again made their appearance in Bengali pop-culture including movies and novels. The iconic movie ‘Gupi Gayen Bagha Bayen’ by Satyajit Ray had elaborate scenes featuring Bengali ‘monda mithai’ (sweets)! Almost each and every Bengali believes their ‘mishti’s to be more than just food; it is an emotion etched in the very essence of their being. So stay with us, as we take a fascinating peek into the world of Bengali sweets. The prominent presence of sweets in Bengali cuisine can be noted throughout history. Ancient Bengal was known as ‘Gauda Banga’, a name believed to be originated from the term ‘Gur’ or molasses that were harvested in abundance in the region. The early Bengali sweets were made from the delicious jaggery or molasses and coconuts. The practice of using ‘chhana’ came much later with the colonial invasions. Early Bengal learned the use of refining sugar to make some of the tastiest sweetmeats. ‘Monda’ made from sugar lumps and ‘batasha’ was the simplest of sweets made from sugar. The traditional delicacies, ‘pithe’ and ‘payesh’ have been ruling the Bengali platter from days of the yore. ‘Pithe’, made from rice flour and jaggery and having sweet stuffings of coconut or sugar were quite popular before the ‘chhana’ conquered the taste buds. There were several sweets made from ‘khoya and kheer’, which are Bengali names for milk solids and condensed milk, respectively. Sweets like ‘nadu’, ‘moya’, and ‘takti’ were popular in ancient Bengal. The uses of different fruits to make a variety of sweets were also prevalent. Books like Manasa Vijaya Kavya, written by 15th-century Bengali poet Bipradas Pipilai, also account for how varieties of ‘pithe’ made from rice flour, jaggery, kheer, and milk solids have been an integral part of Bengali rituals and festivals. ‘Payesh’, another delectable Bengali dessert, traditionally made with milk, a special variety of rice and jaggery or sugar, has been a part of Bengali cuisine for over a century. The introduction of ‘chhana’ in Bengali cuisine happened after the Portuguese invaded Bengal, yet it’s interesting how today most of the characteristic Bengali sweets are made primarily from fresh ‘chhana’ (cottage cheese) and sugar. The curdling of milk with an acidic substance was forbidden according to Hindu cultures, but the Portuguese loved their cheese. After settling down in and around Kolkata in the 17th century, the Portuguese tradition of making sweets with cheese inspired the local cuisine as well. The Bengali confectioners then picked up this incredible art of curdling milk and creating mouth-watering ‘sandesh’ and ‘rosogollas’ among others. While the world of Bengali sweets is expansive, there are few that have attained ‘cult’ status not only among Bengalis, but in the other parts of the country and the world, too. Amusingly, some of these sweets have very unique names along with interesting origin stories. The now-controversial rosogolla that made Bengal famous on the global map, was created by Sri Nabin Chandra Das in his small shop in Baghbazar, in the latter part of 19th century. ‘Rosomalai’ was invented by his son Sri Krishna Chandra Das in mid-20th century — plus, it was he who is responsible for the iconic stature that rosogolla has achieved across the world. ‘Ledikini’, the cylindrical deep fried sweet made from ‘chhana’ was possibly named after the Lady Canning, the wife of Lord Canning. The sweet was prepared by the famous sweet-maker Bhim Nag on her birthday. Bhim Nag and Dwarik Ghosh were two of the famous ‘sandesh’ makers of Bengal. Sri Ramakrishna Paramhansa, yogi and one of the most prominent religious figures in Bengal loved ‘sandesh’. Rani Rasmoni, the patron of Sri Ramakrishna Paramhansa, used to carry sweets prepared by Bhim Nag whenever she met the yogi. 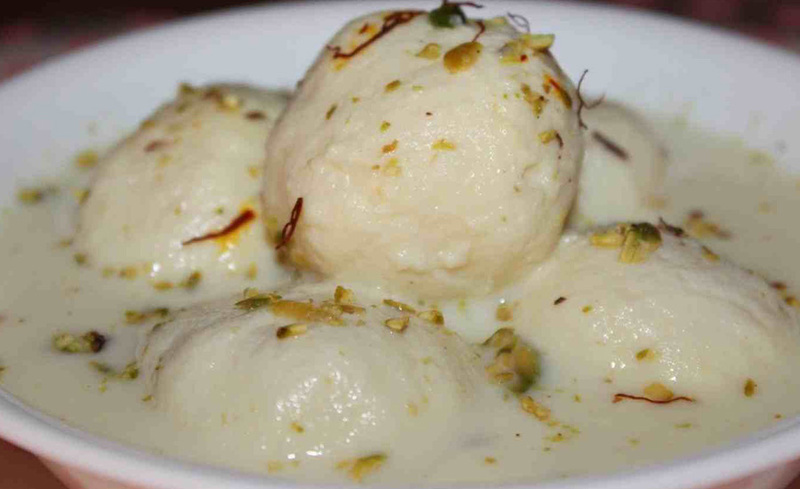 In fact, it is believed that Swami Vivekananda and Sri Ramakrishna met because of their love for ‘rosogollas’. ‘Jalbhara/ talsas’ is a sweet shaped like a ‘tal’ or kernel of the palm fruit. 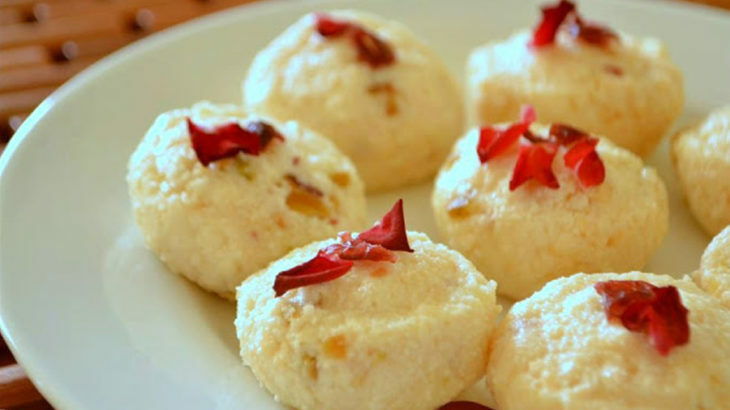 The sweet was created on the event of ‘Jamaisasthi’ by Surjya Modak. It is filled with sweet ‘Nolen gur’ inside and thus got its name. According to stories, Bandopadhay family of Chandernagar requested these sweets for their son-in-law. When he took his first bite of the sweet, the sweet juice spilled out. The sweet, thus, got well-known among the Bengalis. The term ‘sandesh’, the delicious sweetmeat made into various shapes from fresh ‘chhana’ means ‘news’. The ‘sandesh’ comes in innumerable varieties. Over the years some of the catchiest names were given to the revolutionary ‘sandesh’ by their makers. ‘Praanhara’ or soul stealer and ‘Abar Khabo’ which translates to ‘Will eat again’ are two of the most prominent sweets. ‘Mouchak’ or the honeycomb named ‘sandesh’ is made from milk and sweet corn but bears a prominent taste of honey. The delicious steamed ‘ice cream sandesh’ or ‘Bhapa sandesh’ made from steamed cottage cheese and served chilled has a self-explanatory name. Bengalis’ famous sweet tooth can be noted among some of the famous Bengalis in the land. The ‘Bard of Bengal’, Kaviguru Rabindranath Tagore loved ‘rosogollas’. The iconic Bengali actor ‘Mahanayak’ Uttam Kumar used to love ‘rosogolla’ as well. Famous Bollywood superstar Mithun Chakraborty loves ‘rosogolla’ to the core. The famous Bengali barrister and educator Ashutosh Mukherjee was an ardent lover of ‘sandesh’ and Bhim Nag named the popular ‘Ashu Bhog’ on his name. Singer and musician Kishore Kumar loved ‘mishti doi’ and legendary singer Asha Bhonsle loved ‘chhanar payesh’. Not only yesteryear personalities, but many young Bollywood actors have also professed their love for Bengali sweets! While Hrithik Roshan loves ‘rosogollas’, Shah Rukh Khan is crazy about ‘kanchagollas’ and ‘abar khabo’. Amir Khan could not have enough of ‘mishti doi’ when travelling to the city. The oldest and the most prominent sweet shops in Kolkata are the Bhim Chandra Nag, established in 1826 and Girish Chandra Dey and Nakur Nandy established in 1844. Located in North Kolkata, these shops have been visited by eminent personalities throughout history. Award-winning director, late Rituporno Ghosh and legendary filmmaker late Satyajit Ray, were regulars to Nakur’s. Some of the other prominent shops include Balaram Mallik and Radharam Mallik, Nalinchandra Das, Sen Mahasay and K.C Das. Some relatively newer establishments like Kamdhenu, Mithai, and Hindustan Sweets have also captured the attention of the foodies of Bengal with their unique creations. Bengali sweets have proved to be show stealers among all the tasty cuisines offered by the state. With their unique names and incredible taste, they can appeal to your sweet tooth like no other in the world. So the next time you’re in the city, don’t restrict yourself to only the famous rosogollas; there’s a vast universe of Bengali sweets to be explored. Do give them a try.